For those of you that managed to download Fire From the Sky before it became contraband, I have a special offer! Due to several people asking for it, here is the PDF of ONLY THE COVER to the Fire From the Sky: Contraband Edition printed specially for my running of it at GenCon. NOTE: This is ONLY THE COVER - I can't repeat that enough - and has been modified to remove the official Gamma World logo (which was one of the requirements in the cease and desist order from Wizards of the Coast). It will be available here for a limited time, and then it will disappear forever (at least until WotC legal says otherwise). Since Legion of Gold, there does not seem to have been any official content for Gamma World besides novels. Do you have any plans for continued support and future content for use in D&D Gamma World4e? This September, we have a Gamma World-themed Deck of Many Things planned for Dungeon. Beyond that, we have no plans to release more content for Gamma World. I'm wary about the term "no plans to release"... I don't know if that means that they simply haven't considered any further content or if they're not going to make any more content ever. I'm staying optimistic that it's the former, but considering their latest reactions I can't really say. And, in light of all the demand for Gamma World content, the only thing they come up with is a converted Deck of Many Things? Really?!? I'm continuing my lobbying in the hopes that I can get clarification on the future of Gamma World, specifically as it relates to third party content. I'm not expecting them to radically change their stance or do something surprising like... you know... update the 4e GSL and the 4e SRD (it's been over two years since that's happened). 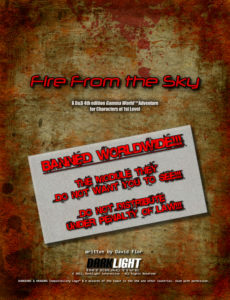 In any event, I will be at GenCon with a few copies of Fire From the Sky: Contraband Edition and my new module - The Coming Dark, Chapter One: Into the Light - in the hopes that I can corner someone from Wizards of the Coast and get some more information. Again, I'm not getting my hopes up, but someone has to try.